1926 - The German Weimar Republic joined the league of Nations. 1933 - Following earlier Nazi Party election successes, Adolph Hitler became Chancellor of Germany in January. He took the country out of the League of Nations later in the year. 1934 - Russia joined the League of Nations. Meanwhile Hitler consolidated his power and in August proclaimed himself Fuehrer. 1935 - Hitler introduced military conscription. 1936 March - German troops were sent to reoccupy the Rhineland. July - The Spanish Civil War started; Italy and Germany became aligned with one side and Russia with the other. 1938 March - German troops marched into and annexed Austria. September - In the Munich Crisis, Czechoslovakia was forced to cede Sudetenland to Germany. 1939 March - Germany completed its occupation of Czechoslovakia and took back Memel on the Baltic coast from Lithuania. Now Britain and France guaranteed Poland's independence. The Spanish Civil War came to an end. April - Italy invaded Albania. May - Britain reintroduced military conscription. Germany and Italy joined forces in the Pact of Steel. August - Following secret negotiations the Russian-German Non-Aggression Pact was signed in Moscow to the world's amazement. Its provisions included the dismemberment of Poland. September 1st - Germany invaded Poland. Poland - After Germany invaded Poland on the 1st, Britain and France demanded the withdrawal of German forces. The ultimatum expired on the 3rd, Prime Minister Neville Chamberlain broadcast to announce that Britain was at war with Germany. Polish Campaign - With Poland partitioned between Germany and Russia, the last of the Polish Army surrendered on 5th October. Poland entered its long dark years of brutality and oppression. Russo-Finnish War - Britain and France planned to send aid to Finland. This would allow them to occupy Narvik in northern Norway and cut back Swedish iron ore supplies to Germany. Russo-Finnish War - A peace treaty on the 13th brought the war to a close, with Finland ceding the disputed territory to the Soviet Union. Norway - The surviving Norwegian troops surrendered to the German Army on the 9th and the Norwegian Campaign was over. The Norwegian people would not be liberated until after the German surrender in May 1945. During that time, large German forces were maintained there at Hitler’s command in case the Allies should invade. France - France capitulated and the Franco-German surrender document was signed on the 22nd. Its provisions included German occupation of the Channel and Biscay coasts and demilitarisation of the French fleet under Axis control. Eastern Europe - Soviet Russia occupied the Baltic states of Lithuania, Estonia and Latvia. In July they were formally incorporated into the USSR. Russia also took over parts of Rumania. Russo-German Cooperation - Only 11 months before German attacked Russia, German raider “Komet” sailed for the Pacific through the North East Passage across the top of Siberia with the aid of Russian icebreakers. She operated in the Pacific and Indian Oceans until returning to Germany in November 1941. Eastern Europe - Hungary and Rumania joined the Axis Tripartite Pact on the 20th and 23rd. Only Yugoslavia and Bulgaria held out against German pressure to become members; the only countries in Eastern Europe and the Balkans not completely dominated by the Axis or Russia. Far East - Five Year Neutrality Pact between Japan and Russia benefited both powers. Russia could free troops for Europe and Japan concentrate on expansion southwards. Britain - Heavy raids on Belfast in Northern Ireland, the Scottish Clyde, Liverpool and especially London on the night of the 10th/11th marked the virtual end of the Blitz. The bulk of the Luftwaffe was now transferring east for the attack on Russia. RAF raids on Germany continued, and grew as a major plank in British and Allied strategy for the defeat of Germany. Eastern Front - On the 22nd, the German attack on Russia - Operation 'Barbarossa' (see map above) - started with the eventual aim of destroying the Russian Armies and occupying the whole of the country west of the line Archangel in the Arctic to the Caspian Sea. Germany and its Axis partners invaded from the Baltic to the Black Sea: North through the Baltic States to Leningrad. Further north still Finland would regain its lost territories; in the centre through Minsk and Smolensk and on to Moscow; and in the south towards Kiev and the Crimea Peninsular in the Ukraine, and then to Kharkov and Rostov before heading for Stalingrad and the oilfields of the Caucasus. Italy and Rumania declared war on Russia on the 22nd. Finland followed on the 26th and Hungary on the 27th. Eastern Front - German forces advanced in all sectors, and in the centre captured Minsk, capital of Byelorussia and surrounded Smolensk on the road to Moscow. Russian losses in men and material were immense. On the 12th, an Anglo-Soviet Mutual Assistance Pact was signed in Moscow. Both countries agreed not to seek separate peace negotiations with the Axis powers. United States - Winston Churchill crossed the Atlantic to meet President Roosevelt off Argentia, Newfoundland between the 9th and 12th. Together they drafted the Atlantic Charter setting out their aims for war and peace. This was signed by Britain, the United States and 13 Allied governments in September. The attack north on Leningrad continued. In the centre Smolensk was taken, but the drive on Moscow was halted. Instead German forces were directed south to help capture Kiev in the Ukraine. Middle East - The possibility of a pro-Axis coup d'etat led to Anglo-Soviet forces going into Persia on the 25th from points in Iraq, the Persian Gulf and Russia. A cease-fire was announced within four days, but later violations led to Teheran being occupied in the middle of September. In the north the siege of Leningrad was about to start, and would not be lifted completely until early 1944. Kiev in the south was captured and Centre Army Group released to continue the Moscow offensive. Further south still, the Crimea was cut off and German forces drioe on towards Rostov-on-Don. As German forces in the centre approached Moscow a state of siege was declared, but the offensive was temporarily halted at the end of the month. In the south Kharkov, east of Kiev in the Ukraine, fell. The German centre advance on Moscow was restarted and troops were soon on the capital's outskirts. In the south they had driven right into the Crimea. Only Sevastopol held out and the siege lasted until June 1942. Further east Rostov-on-Don was captured, but the Russians re-took the city. Declarations of War - In a series of diplomatic moves, numerous declarations of war were made: 5th-6th December - Britain, Australia, Canada, New Zealand and South Africa declared war on Finland, Hungary and Rumania. 11th-13th December - Germany, Italy, Rumania, Bulgaria and Hungary against the United States. 28th December-14th January - Britain, Australia, New Zealand and South Africa against Bulgaria. As the Germans halted outside Moscow, the Russians launched a major Counter-Offensive starting from near Leningrad in the north down to the Ukrainian city of Kharkov in the south. By April 1942 Russian forces had regained much lost territory, but few major cities. The siege of Leningrad continued. Arcadia Conference - In late December and early January, Winston Churchill and President Roosevelt with their Chiefs of Staff met in Washington DC. They agreed to the setting up of a Combined Chiefs of Staff Committee and to the defeat of Germany as the first priority. On 1st January the United Nations Pact embodying the principles of the Atlantic Charter was signed in Washington by 26 countries. The Russian advance continued to make headway. In the centre it reached to within 70 miles of Smolensk. To the south they drove a deep salient into the German lines south of Kharkov in the Ukraine. However German resistance grew as the Russians begin to over-extend themselves. The Russian Counter-Offensive launched in December 1941 in the north and centre came to a halt. Territory had been regained but few cities. The Russians maintained their hold on the Kharkov salient in the south. In the south, Russian forces attacked from the salient below the Ukrainian city of Kharkov and made some progress, but the Germans counter-attacked and soon encircled and captured the Russians. The Germans pushed on beyond Kharkov ready for the main Spring Offensive. United States - Winston Churchill flew to Washington DC for another series of meetings with President Roosevelt. They agreed to share nuclear research and concentrate the work in the United States. Agreement did not come so easily on the question of where to open a Second Front in 1942. The Americans wanted to land in France to take pressure off the Russians, but the British considered this impossible at present and proposed the invasion of French North Africa. The President did not come to accept this until July. Czechoslovakia - Reinhard Heydrich, German 'Protector' of Czechoslovakia died from wounds sustained in an assassination attempt in May. In part reprisal, the village of Lidice was wiped out and its people murdered. Towards the end of the month the Russians started to evacuate Sevastopol and by early July all the Crimea was in German Hands. By this time the Germans had started their Spring Attack in the south with the aim of taking Rostov-on-Don and pushing further south towards the vital oilfields of the Caucasus. Meanwhile, from the area of Kursk and Kharkov, a second army group would move on Stalingrad to protect the left flank of what was initially the main thrust to the south. Stalingrad later dictated the outcome of the entire campaign. In the south the German Spring Offensive continued with the taking of Rostov-on-Don. After crossing the Don River they pushed on into into the Caucasus. Meanwhile the protective left flank army group was approaching Stalingrad. The German advance into the Caucacus came at a critical time for the North African campaign, opening up the possibility of a German link-up in the Middle East. The loss of the region's oil and the potential for a German-Japanese meeting in India could have proved fatal for the Allies. The south continued to be the main focus of this long and bitterly contested front and remained so until January 1943. In the Stalingrad area the German reached the River Volga and were within a few miles of the city at the start of the Battle of Stalingrad. They broke into the suburbs in September and the fighting increased in intensity as the Russians struggled to hold on to the west bank of the Volga. Further south still, the German invaders reached the Caucasus Mountains, but thereafter made slow progress. Still concentrating on the south, the Germans made little progress in the Caucasus. By November they were being worn down and the Russians started to go over to the offensive. Hitler decided to take Stalingrad and major attacks were started in October and then November. Neither attacks succeeded in merciless factory-to-factory, house-to-house, room-to-room fighting. In the south, as the German forces in the Caucasus and within Stalingrad were slowly ground down, the Russians started a long-planned Major Offensive to relieve the city and trap the invaders in the Caucasus. Along 50-mile fronts to the north and the south of Stalingrad, two large armies broke through the largely Rumanian defenders. Before the month was out the Russian pincers had met and Gen Paulus’ Sixth Army was surrounded. In the south, a scratch German force tried to reach Stalingrad from the southwest but was soon driven back. Further north, the Russians resumed their push and annihilated an Italian army. By now the Germans in the Caucasus were under heavy pressure. Fearing the Russians would reach Rostov-on-Don and trap them, they started to withdraw from the oilfields considered so important by Hitler. Russian strength was now great enough to attack along other parts of the front as well as in the south. In the north they managed to open a narrow corridor through to Leningrad. The siege was partially lifted, but another year was needed to complete its liberation. The offensive in the centre/south continued with the Russians aiming (from north to south) for Kursk, Kharkov and Rostov-on-Don. In the south itself, the pressure on the trapped Germans at Stalingrad was increased. A powerful attack starting early in the month forced Gen Paulus and the remnants of Sixth Army to surrender on the 31st January with the last troops giving in on the 2nd February. The Battle of Stalingrad was at last over. Further south still German forces in the Caucasus retreated as the Russian attacks gathered momentum. Those who coukd, escaped through Rostov-on-Don before its inevitable fall. By mid-February in the centre/south the Russians had liberated the cities of Kursk, Kharkov and Rostov-on-Don, but within a matter of days German forces started a successful counter-attack around Kharkov. In the south with the Russian capture of Rostov-on-Don, those Germans left in the Caucasus were driven back towards the Taman Peninsula opposite the Crimea. Until now the Germans had held on to the salients in the Moscow area left over from the Russian winter offensive of 1941/42 in the north and centre. Under attack they pulled back and straightened their lines. In the centre and south, the Germans retook Kharkov, but the Russian Army held on to the salient around Kursk. As the front stabilised both sides prepared for the coming Battle of Kursk - the greatest tank battle of the war. War Crimes - The site of the massacre of Polish officers was found at Katyn near Smolensk: the Russians and Germans accused each other of the atrocity. In the south the Russians squeezed the Germans trapped in the Caucasus further into the Taman Peninsula across from the Crimea. Here they held out for a further six months until October 1943. There was little activity in the north and Leningrad had to wait until early 1944 for the siege to be fully lifted. It was a different matter in the centre/south where the Battle of Kursk was fought. The Germans attacked the 100-mile wide salient around Kursk from the Orel in the north and Kharkov in the south. Total forces engaged on both sides included 6,000 tanks and 5,000 aircraft. Russian defences were well prepared and in depth and the Germans made little progress. Within a week they had ground to a halt. Losses were heavy on both sides. Now the Russian armies launched the first of numerous offensives in these sectors, which by year's end saw them reaching Byelorussia and recapturing more than half the Ukraine. The first attacks were north of Kursk against the German salient around Orel. In early August it was the turn of Kharkov to the south. From east of Smolensk south to the Sea of Azov the Russians attacked and pushed forward all along the line: in the centre towards Smolensk itself; in the centre/south first Orel and then Kharkov were captured, followed by an advance towards the Ukrainian capital of Kiev; in the south from the Rostov-on-Don area towards Odessa, threatening to trap the Germans in the Crimea. The Russians continue to push forward in the centre and south, capturing Smolensk on the 25th September. Thereafter they made little progress in this area for the rest of 1943. British Aegean Campaign - With the surrender of Italy, Winston Churchill wanted to seize the Italian Dodecanese islands in the southern Aegean before the Germans could establish themselves. From here the Allies could threaten Greece, support Turkey and (with an eye on the post-war world by Mr Churchill) forestall future Russian moves in the Balkans, but the Americans and some British commanders were lukewarm on what they saw as a sideshow compared with the battle for Italy. Insufficient forces and especially aircraft were made available, and the Germans soon took Rhodes from where, together with other bases, they maintained air superiority throughout the coming campaign. In the centre and south the Russians still made little progress against fierce German resistance. Further south still the remaining German troops in the Caucasus evacuated the Taman Peninsula and were ferried across to the Crimea. In the centre/south, Russian forces captured Kiev, capital of the Ukraine on the 6th and pushed on. However, the Germans managed to counter-attack and recaptured some of the towns to the west of the city. A larger German counter-offensive in the same area faded out by early December. Further south the attacks towards Odessa finally cut off the Germans in the Crimea where they held out until May 1944. Since October 1943, five Russian attacks in the centre had been launched against the Germans west of Smolensk. The greatly outnumbered defenders had held on, but the Russians now had a foothold back in Byelorussia. In the centre/south all the Ukraine east of the Dnieper River together with deep bridgeheads across much of its length were now in Russian hands. They prepared to recover the rest of the Ukraine, push into the Crimea and move on Poland and Rumania. Now the German invaders in the north felt the weight of Russian attacks. A series of offensives drove them back from the gates of Leningrad by the end of January. By early March the Russian armies had regained a large chunk of Russian territory that took them just over the border of northern Estonia and close to Latvia. Here they stayed until July. Meanwhile, the massive assaults continued in the centre/south from north of Kiev down to the Black Sea, and the ground lost to the west of Kiev was soon regained. The Russians pushed on and early in the month crossed into the southeast corner of pre-war Poland. In the centre the Russians moved further into Poland. All the time German commanders were severely restricted by Hitler's refusal to allow them to fall back on more defensible positions. Large formations found themselves encircled by the Russians and the Germans' limited resources were used up in rescuing them. Nearly all the Ukraine was now back in Russian hands and in the south the advance towards the southwest brought the Russians to the foothills of the Carpathian mountains, just inside pre-war Rumania. Thoroughly concerned about the potential collapse of the Balkans, Hitler ordered troops into Hungary to prevent the country leaving the Axis. As this happened the Finnish Government was trying to negotiate an armistice with Russia. In the south the Russians started the task of clearing the Crimea. Further west, on the 10th they captured the major Black Sea port of Odessa. Air War - In one facet of the air war, a V-2 rocket crashed in Poland near Warsaw and resistance groups managed to arrange for the parts to be successfully airlifted to Britain. Against fierce German resistance, the Russians in the south had now re-captured all the Ukraine including the Crimea. In the centre, they were over the border into pre-war Poland and Rumania. In the far north Russia attacked into southern Finland on the 10th in order to force the government to the negotiation table. Fighting carried on into July, but by early September a cease-fire was in effect. In the centre of the main front, the Russians started the First of their major summer offensives on the 23rd from around Smolensk. The aim was to clear the Germans out of Byelorussia and head on for Warsaw, East Prussia and the Baltic through Lithuania. Germany - In the 20th July Bomb Plot, a device left by Col von Stauffenberg in Hitler’s East Prussia headquarters only injures him slightly. The attacks in the centre pushed on. Minsk, capital of Byelorussia was taken by the 4th and by mid-month all the Russian republic had been liberated. Vilna, disputed capital of Lithuania, was captured on the 13th. By the end of July the Russians were approaching the outskirts of Warsaw. In the north, the Second Main Phase of the summer offensive got underway with the aim of ejecting the Germans from the Baltic states. The Third Phase started in the middle of the month in the centre/south from the Ukraine into southern Poland. Lvov was taken on the 27th. Nearly all pre-war Russia had now been liberated. On the 1st, the Polish Home Army launched the Warsaw Rising against their German oppressors. With little help from outside, least of all the Russians, the fight went on through August and September 1944 until the Poles were finally crushed with great brutality. Around 200,000 died by the time the survivors surrendered on 2nd October 1944. Further south the Russians gained a bridgehead over the River Vistula and their forward lines ran along much of the length of the Carpathian Mountains by month's end. By now running short of supplies and facing increasing German resistance, this sector was stabilised until January 1945. 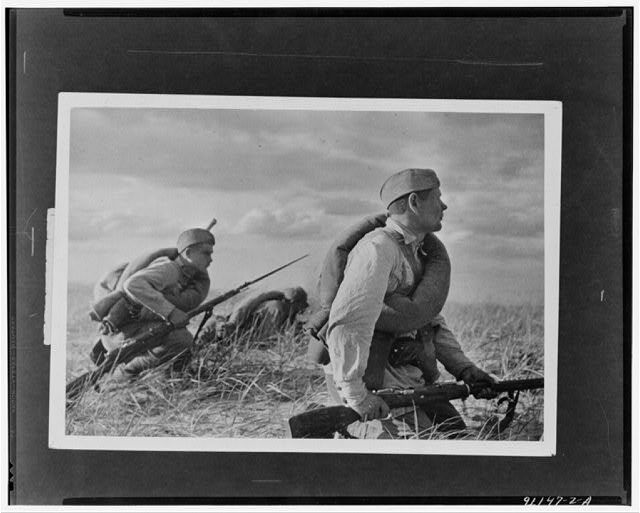 However the Fourth Phase of the Summer offensive started in the far south, aimed at clearing the Balkans. The Russian armies attacked on the 20th from the Ukraine south and west into Rumania. Events moved rapidly. Three days later Rumania accepted the Russian armistice terms, on the 25th declared war on Germany, and by the 31st the Russians were entering Bucharest. Now Bulgaria tried to declare its neutrality and withdraw from the war, just as the Russian forces swung west and north towards Hungary and on to Yugoslavia threatening to cut off the Germans in Greece. In the Arctic, the Russians started a series of attacks and amphibious hops which by the end of the month had driven the Germans back from the Murmansk area just over the border into Norway. The Russians, now joined by Norwegian troops, came to a halt. Still in the north in the Baltic States, Riga capital of Latvia was captured on the 15th. By then the Russians had reached the Baltic north of Memel, which eventually fell in January 1945. German troops fell back in to the Courland Peninsula of Latvia and held out there until May 1945, but by the end of October most of Estonia, Latvia and Lithuania were free of the Germans. Following an abortive uprising in eastern Czechoslovakia in late August, the Russians now attacked over the Carpathian mountains from southern Poland and were cross the border in mid-month. In the Balkans, the struggle up through Hungary continued, but the Russians could only reach the outskirts of Budapest in early November. Meanwhile the Eastern Allies were advancing into Yugoslavia and joined forces with units of Marshall Tito's partisan armies on the 4th. Belgrade fell on the 20th. The main activity was in Hungary where the Russians still battled towards Budapest, and in the Balkans as southern Yugoslavia was cleared by the Eastern Allies. In Hungary the Russians attack towards Budapest, reaching Lake Balaton early in the month and encircling the city at Christmas. Following the setting up of a provisional Hungarian Government in the Russian-held area, war was declared on Germany on the 31st and an armistice signed with the Allies in late January 1945. All along the Polish Vistula front the Russians started a major offensive through Warsaw directed at Berlin. Devastated Warsaw fell on the 17th and by the end of the month they had gained a huge wedge of territory taking them over the border of Germany to the River Oder only 60 miles from the German capital. The Germans were now cut off in East Prussia and some 1 1/2 million servicemen and civilians were evacuated by the end of the war. To the south, the Eastern Allies continued to fight their way through Czechoslovakia as the Russians struggled to capture Budapest in Hungary. Having penetrated into Germany the Russians pushed out north towards the Baltic coast and southwest, so that by the beginning of March they were establishing themselves along the Oder-Niesse line of rivers. In Hungary, Budapest finally fell on the 13th. By the end of March the Russians had taken most of the Baltic coast of Germany and Poland east of the River Oder and captured Gdynia and Danzig. They were now poised along the Oder-Niesse Line ready for the final attack towards Berlin. To the south, the Eastern Allies continued their progress into Czechoslovakia. In Hungary the Germans made their last important counter-offensive of the war around the Lake Balaton area. By mid-month they had been stopped and the Russians drove on towards eastern Austria. As the Eastern Allies fought through Czechoslovakia towards Prague, Hungary was finally freed of the Germans, and the Russians pushed into Austria, capturing Vienna on the 13th. To the north, as the Western Allies came to a halt along the line of the River Elbe, the Russians started their final, massive drive into eastern Germany from the Oder-Neisse Line. They had surrounded the German capital by the 25th and the Battle for Berlin got underway. Surrender and Occupation - At Gen Eisenhower's HQ at Rheims in France on the 7th, the unconditional surrender of Germany was signed to take effect from midnight on the 8th - VE day. On the 9th it was ratified in Berlin and signed for the Allies by Air Chief Marshall Tedder (as Gen Eisenhower's Deputy) and Russian Marshal Zhukov. As the last remaining German forces surrendered in France, Germany, Norway and elsewhere, and the Allies completed the liberation of all Europe from their hold, the four major powers moved into their zones of occupation in Germany and Austria. The war in Europe was over. Far East - Russia declared war on Japan on the 8th and invaded Manchuria early next day overwhelming the Japanese defenders.